The Boston & Worcester Railroad began construction between its namesake cities in August 1832. The line opened nine miles from Boston to West Newton in April 1834, honoring the B&W as the first steam-powered railroad in New England. The full 44-mile route was completed to Worcester by the following July. The Western Railroad extended the B&W's reach, linking Worcester with Springfield and Albany by 1841, a distance of 156 track miles. The two railroads merged to form the Boston & Albany in 1867, and the mainline is still active today with CSX freight, Amtrak's Lake Shore Limited, and MBTA commuter trains (Boston-Worcester). The Boston & Albany had several branches including the 12-mile Milford Branch built in 1847. This branch linked Milford with the B&A mainline at Framingham via Holliston and Phipps Tunnel. Passenger service operated on the branch until 1959 and freight service into the 1990s. The line was abandoned from Metcalfs Station (Cross St., one-third mile south of tunnel) to Milford by Penn Central in 1972, from Holliston to Metcalfs (including tunnel) by Conrail in 1987, and the remainder from Framingham to Holliston by CSX in 2001. 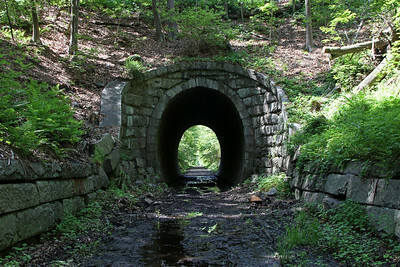 Phipps Tunnel, located at milepost 6.42 of the Milford Branch, extends 92 feet beneath Highland Street on the south side of Holliston. The tunnel is brick lined with portals of cut stone. A pipe carries water under the tunnel from south to north, but drainage was problematic in the cut at the tunnel's north end. 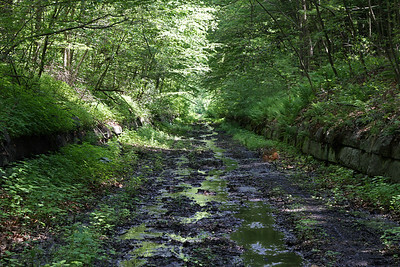 Mud and water would flood the tracks, held back only by a 4-foot high retaining wall of cut stone. The tunnel remains in good condition but a number of stones have shifted due to poor drainage, especially at the north portal. 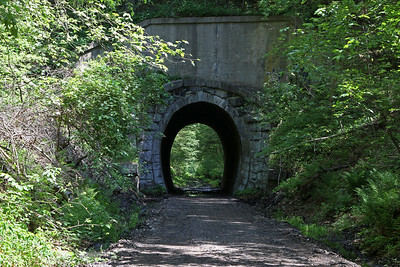 Track was removed through the tunnel in 2004 for the Upper Charles Rail-Trail, although significant grading and drainage are still required in the cut north of the tunnel (as of Spring 2012). Looking east from the tunnel in 2012 where significant drainage work is required for a passable rail-trail. Note the cut stone used to line the cut, likely dating to the original construction of the railroad.